Is this putting everything from the mat into your hand at once, or are you choosing any you like from it? If the former, there's no point in the mat at all, just set the cards aside like Haven. It let's you choose which and how many cards you like to take. "any" instead of "all". Is that correct wording wise? It would be clearer if it was worded "any or all." Okay, changed it in the inital post. +1 Action. Take the Patent. Trash a card from your hand. Put a token onto the Patent for each $1 in its cost. At the start of your Buy phase, if there are any tokens here, +1 Coffers and remove one. Inquest and Patent are a replacement for Renaissance's Research. Research is a middle-of-the-road, not particularly interesting, trash-for-benefit, that wants to be Apprentice but isn't. Research doesn't use any mechanisms unique to Renaissance. Research is not a simple card. Research is a Duration, which is not one of Renaissance's themes, and is one of only two Duration cards in the set, requiring another set of rules! So much for being a simple expansion! Inquest can be used to similarly tempo-trash. Since trash-for-coffers is insane, Inquest gives them to you in a trickle--and through an Artifact at that! 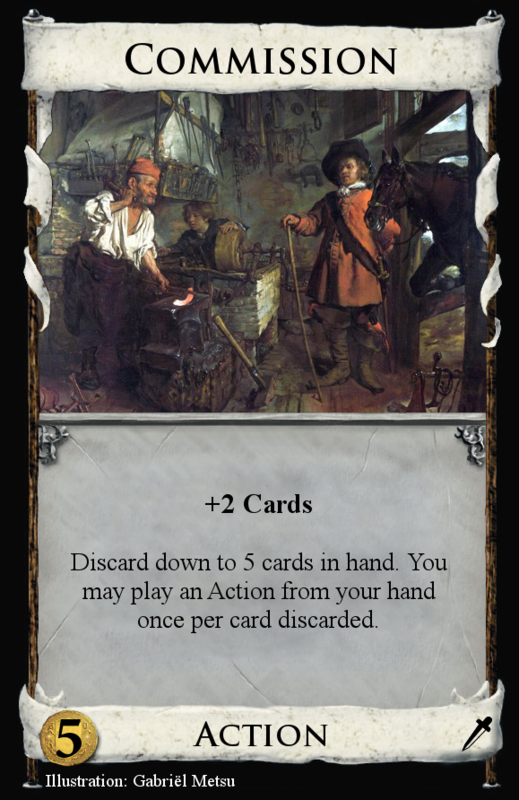 Inquest provides a unique trash-for-benefit (rather than a wannabe Apprentice), as it creates a trash-for-coffers--but can also be used to control the Patent by trashing Coppers. Patent is an additional Artifact, adding to the four cards that use them in Renaissance, which helps them feel more at home. Inquest and Patent are also not very simple, but they replace something that wasn't either (after rewording, Inquest comes out to 41 words to Research's 36 words, so that's not too bad as far as "word complexity" goes). Patent is fairly conservatively designed. 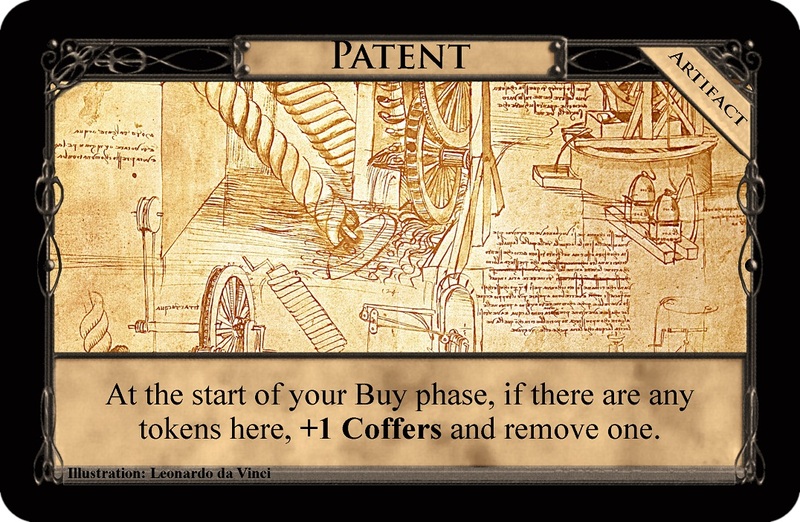 One can expect Patent to receive 6 tokens per player for their 3 starting Estates, which means that in a 16 turn game (of which, only 14 can typically involve Patent), one would expect around 8 turns that don't have tokens coming off Patent. Patent is not something you would aim specifically to build up, much like one doesn't build up Trade Route: To do so is likely to hamper yourself as you provide an equal benefit to all players. It also doesn't behave like other Trash-for-Benefits in the way that one trashes everything to Remodel\Salvager in the end-game. 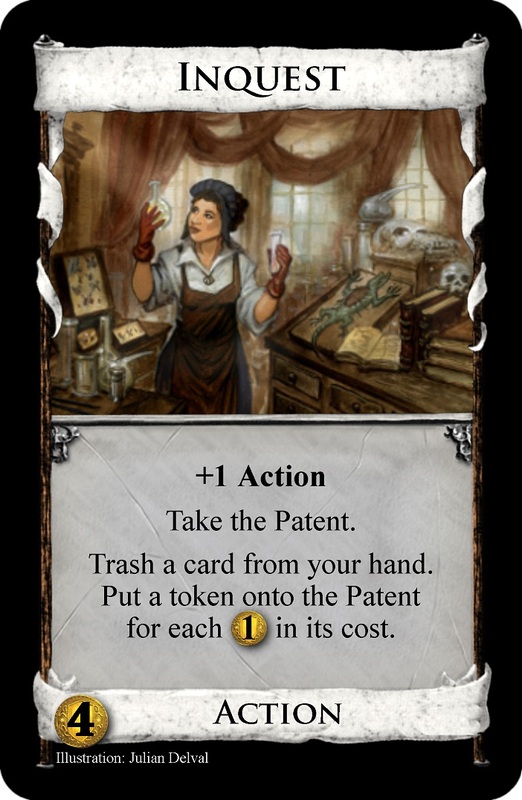 Because the Coffers come at a slow pace, trashing valuable stuff to Inquest (even ignoring the competitive aspects of Patent) is probably not something you would do more than once, and probably mostly because that card you are trashing has become inconvenient. I've never enjoyed playing Salvager, and it didn't seem to fit the theme of Seaside anyways. Ransacker replaces it and would be (I think?) the first duration trasher. This is too good as it will quite soon, once Estate and Copper are in the trash, become a mixture of Amulet and Merchant Ship. Meant to replace Rebuild as Dark Age's TFB. Looks fun, but looks a lot like lookout. Annex is the dud of Empires. It's expensive and niche, I can never remember whether I'm supposed to be picking 5 good cards or 5 bad ones, and most of the time, I only buy it with an extra buy on the last turn of the game. Plus it looks particularly bad next to Donate. Campaign is my attempt to fix these issues: it's still 8 debt and gains a Duchy, but now it Schemes up to five cards, maintaining some of Annex's intent, but making it much more useful in more situations. While Annex is too weak, I think there's a good reason it is not this strong. This is just a "win more" event; as soon as you can pull your deck together, it basically guarantees that you never dud out again. My thoughts exactly. While I definitely approve of you trying to replace Annex (Barf) This doesn't seem like it keeps the same intent. Annex only seems worth it in the rare case when you are playing an ugly slog, and you happen to have a higher than usual amount of good stuff in your discard pile, letting you get one more good turn before you get back to the other junk in your deck. This seems more like Engine payload. That was also kind of the point: to be an upgraded lookout. One with TFB and draw rather than just straight trashing and topdecking. Hey! Sorry to interject. I love following this thread and occasionally submitting when I have a good idea, but I am not on the forum all the time and sometimes fall a little behind. With the popularity of this thread, and especially as the number of contests grows, it can get a little unruly to find exactly what the current contest is/where the entries for this week start. Is it possible to have a mod edit the first post periodically with info about the current contest, and maybe a list of all prior contests, the winning card from each, and ideally a link to the post where the cards were judged? Idk how feasible all that is, especially since the OP wasn't a mod. Perhaps moving this to a child board could help? Not sure of the best way to do this, but I think it could be really helpful! The simplest solution would be to simply make a new thread for the contest each week. Personally, I think that a new thread is much easier to miss, and will thin out the topic even further. I agree with Phoenix. Each contest gets more than enough replies that it will sustain its own thread. And not sure what you mean by a new thread being easier to miss... how can a new thread titled something like "Weekly design contest #20" possibly be easier to miss than scrolling through the last few pages of a 27-page thread to find where a new contest began? I am replacing Rebuild, but I made it look like lookout. I wanted to keep the "TFB from deck" aspect of it, though now that I think about it, it might be a little weak for $5. What if I made it up to $3 more? +1 Buy. Discard 2 cards. You may look through your discard pile and trash up to 2 cards from it. When another player plays an Attack card, you may first set this aside from your hand. If you do, then at the start of your next turn, +1 Action and return this to your hand. The parallels to Horse Traders are cute, but the card feels pretty awful with the mandatory 2 card discard. Being worse than Ruined Market isn't funny. I'd much rather it let you discard up to 2 cards to trash up to the same number from your discard pile. The Reaction also feels really random. Hinterlands really needs both +Buy and +Actions, but the +1 Action on Cattle Traders seems gratuitous, as opposed to Horse Traders' +1 Card which wildly strengthens its own on-play. +1 Action. Reveal the top 3 cards of your deck. You may trash one to gain a card costing up to $2 more than it. Put one into your hand. Discard the rest. I wanted to keep the "TFB from deck" aspect of it, though now that I think about it, it might be a little weak for $5. I get that people don't think Remodel is amazing, but guys, Remodel is bonkers. Remodel on a cantrip would be too strong to balance. This is Remodel on a Laboratory with extra sifting. It must be irreparably broken. While I disagree that a new thread would necessarily be easy to miss, I believe the Weekly Design Contest Thread would quickly flood the "Variants and Fan Cards" sub-forum, which would be discouraging if you wanted to post in literally anything else. If we wanted to start posting individual threads for the Weekly Design Contest Thread, I would like to have a dedicated sub-forum for it. No, you only get to draw 1 card, and the TFB has to come from the top of your deck, giving you a lot less flexibility than Remodeling from your hand. I compare it more to Upgrade, which is a cantrip and has the "exactly 1" caveat, but also trashes from your hand and can trash Coppers for nothing (barring Poor House). 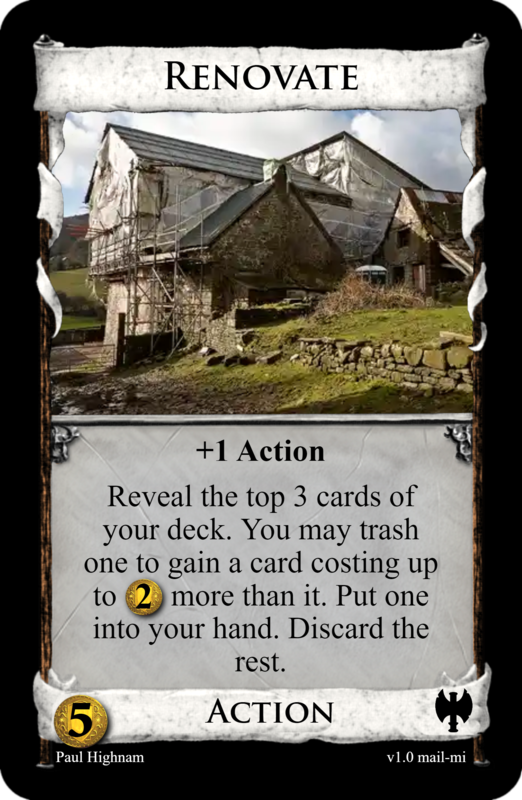 Renovate is also a cantrip, but with extra sifting and "up to $2", but it has to be from the top of your deck. But you're right, it's probably not too weak for $5. This thread shows up in "New replies to your posts". New threads don't. I personally check for new threads only rather unregularly these days, though I check for replies whenever I go online. Maybe this is not how other people do it. Apparently you can choose to get notified of new replies to a child board, so I'd be in favour of that over just spawning a new thread a week. The "usually" suggested way to fix Rebuild is to make it Expand one of the top three cards of your deck. Fragasnap is probably right, adding draw to Remodeling/Expanding out of hand is too good and might lead to the same boring monostrategies as with Rebuild. Arguably it is even easier to play with sifting cantrips that Remodel "on the way" than with Rebuild. I tried using "New replies to your posts" as well as "show unread posts since last visit", but I found both weren't that helpful, because they're mostly huge lists of really old threads that I just happened to post in once a very long time ago. But I always look at which forums have the "unread posts" icon; and then either read a thread or not based on my interest in the title. If you have no other Sorcerer's Stones in play, set aside an Elixir from the supply in front of you. +1 coin per 2 Elixirs you have set aside (rounded up). 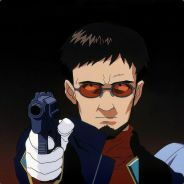 Setup: put 10 Elixirs out per player. This card is not in the supply. Elixir is just a token card to count how much your sorcerer's stones are worth. Maybe it would be better to use actual tokens, as they take up less space, but Alchemy doesn't include tokens and I didn't think I should add any. Sorcerer's Stone is like Philosopher's Stone in that it increases in value throughout the game, but takes out the counting of the deck and discard which (for those of us who play with the physical copy) takes a ton of time. Elixir is a treasure because I didn't know what type to give it and there are alt-vp cards counting both actions and victories. I wanted to remove all possible interaction with other cards (as a token would do) but I might have missed one. It shouldn't matter because it's never in your deck until the end of the game. I'll get the judging done this evening so there's probably about 8-10 hours left for any last minute entries! Thanks for all the great entries! I was really tired when I wrote this so please shout at me if I said anything stupid or messed something up! A change for Ruins was unexpected! I'm not sure whether herw's intention was for this to replace Ruins or be used in addition to the 5 old Ruins or to replace one particular Ruin though. I am of the opinion that Ruins play too similarly to Curses so they don't really open up as much new design space as an alternate junk card could have done, the idea of a self trashing junk card seems like a promising alternative to me. Harvest is an obvious choice for replacement being one of the worst cards in the game for its cost. This is very similar to Harvest and I'm not sure that at $6 is much better than Harvest was for $5. Cultist is another super obvious candidate for removal, although for the opposite reason of Harvest. This has a similar feel as Cultist being a junker that you can potentially chain but is much less powerful. I think the problem though is that Witch is a really powerful $5 and changing the Cursing to Ruining is not that much of a downgrade so I'm fairly sure that this card is also incredibly powerful. Having said that this card is much less obnoxious than Cultist and might actually be more fun to play than Witch as after the dust settles having a deck filled with Ruins and Labs seems like a better experience than one with Moats and Curses. Pirate Ship should get the axe in a 2nd edition for sure. This seems like some kind of combination of Bishop and Pirate Ship. But if you play this for the Islanding then it also powers up your opponents Privateers for money making as well as giving them some free thinning, it seems really weak to me. Miser isn't held in particularly high regard and this seems to be worse than it in almost every way, the only real advantage is that this can remove Estates from your deck. It also has issues when you can't play many Actions. I think both Pearl Diver and Lookout are good options to remove. I appreciate that this is trying to get the feeling of 2 cards in one, I like that if you have 2 then the first one can put a bad card on the bottom for the other. Fool might be my least favourite card in the game, although I quite enjoy Lucky Coin. I didn't like the first version of this because it used Boons and I think it's really bad that 3 out of the 7 Heirloom cards use Boons so I'm glad that Asper changed that. I guess the worry is that Lucky Coin gives a really big boost to money strategies and this card might make a boring money deck too good too often in conjunction with the Lucky Coin. I can't really know whether that is actually a problem without playing with card though. I like the top part of this as a Peddler type thing, not strictly better or worse than Peddler. I suppose it would be nice to have a reaction in Seaside, although Lighthouse is Reaction-like and I feel like Seaside might have no Reactions to balance out Hinterlands having so many? Or maybe I made that up? Anyway, I'm not a huge fan of putting random Reactions on otherwise cool cards and Donald X. seems to regret a few reactions like Fools Gold and Trader so I'm not totally sold on that part. I quite like this, it captures the unique thing that Harvest does but isn't completely terrible. Cornucopia also doesn't actually have a real terminal draw card either so it fills a bit of a gap in the expansion. Hard to tell whether 6 is the correct number without playing any games with it but i think a drawing harvest is a nice idea. Rebuild is obviously a strongly disliked card so a good choice. As others have pointed out this seems like quite a powerful card, probably in league with Sentry and Junk Dealer and Recruiter and such. It doesn't do too well with Coppers though (unless there's any good $2s of course) and I like that it could impose some interesting decision making if you reveal 2 Coppers and a good card, as you don't really want to trash the Coppers or put them into your hand. A "turbo Renovate) strategy could prove problematic though, as look 3 cards deep should make them fairly easy to chain. I don't know why Mint needs replacing, it's a really cool card! It has a pretty unique dynamic which I really enjoy. This card is basically just a buffed Mint for $6, which isn't particularly interesting to me. Coffers in Prosperity isn't out of the question as Prosperity comes with Coin tokens for Trade Routes and mats for VP tokens (my old version did, I'm not sure whether more recent printings still do), although i don't think prosperity should have Coffers. This card seems very similar to Thief, but you can get the Treasures in hand next turn. It doesn't fix the Copper trashing prolem of Pirate Ship or the scaling issues with more players that Thief had so I can't say I'm a fan of this. This doesn't really fit the brief as Seaside doesn't have Projects or Trashing tokens so it wouldn't work in a 2nd edition Seaside set. I'd be sad to see the Duchess' baby removed from the game but Duchess is pretty awful. 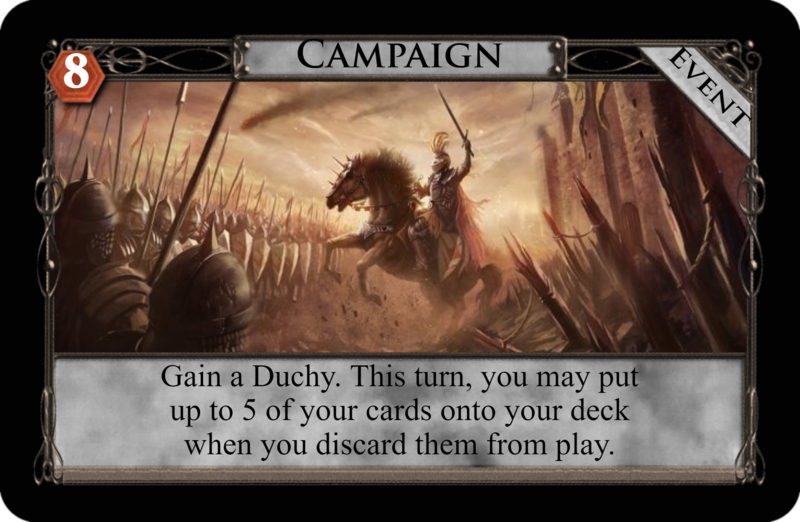 I like that this gives you a reason to want Duchy in your deck as it costs $5 so is nice to reveal with a distillery. I wonder whether this is actually bonkers though, with decent trashing it probably isn't too hard to make this hit a $5 pretty consistently. I think I'd also prefer it if the gain was mandatory as then it would be a bit riskier to balance it out a bit. I feel like Annex gets more hate then it deserves to be honest. The free Duchy aspect spices up the endgame a bit and it isn't too uncommon that you don't want Province for $8 anyway due to endgame positioning. I appreciate that there isn't a Scheme Event so that's a nice effect you found and I never remember exactly what Annex does either which isn't a good sign for the card really. I think Trader is a decent choice, mainly due to the reaction confusion. I like the discard 2 cards and trash from the discard part. Having the +Buy on here is a bit different I suppose, this is bad when you're finished trashing but not completely useless and could still be instrumental if there's no other +Buy. I think that's pretty funny too. I'm not sure about the reaction, +1 Card is a generically beneficial thing to get but +1 Action is more situational as you actually need an Action to use it, so that doesn't strike me as the best choice for a reaction effect. There is one massive problem with this though and that's that cattle simply don't exist in Dominion (Silk Road is inconclusive) so this card needs a major thematic overhaul. Proposing an improvement to Renaissance so soon is a ballsy move. I actually agree about the 2 Durations in Renaissance seeming off for an expansion that's trying to focus on simplicity. I think the Artifact overcomplicates this though and it seems really risky if you let your opponent steal it after you put some tokens on it. I think the way I'd do this is to have the Inquest put tokens on itself to track what it's drawing, then you can even do the fun Apprentice-like decks that Research doesn't do. This is always going to make at least $1 so it's kind of like Amulet but you get 2 out of the 3 options. It'll also upgrade to producing +$2 fairly soon too. 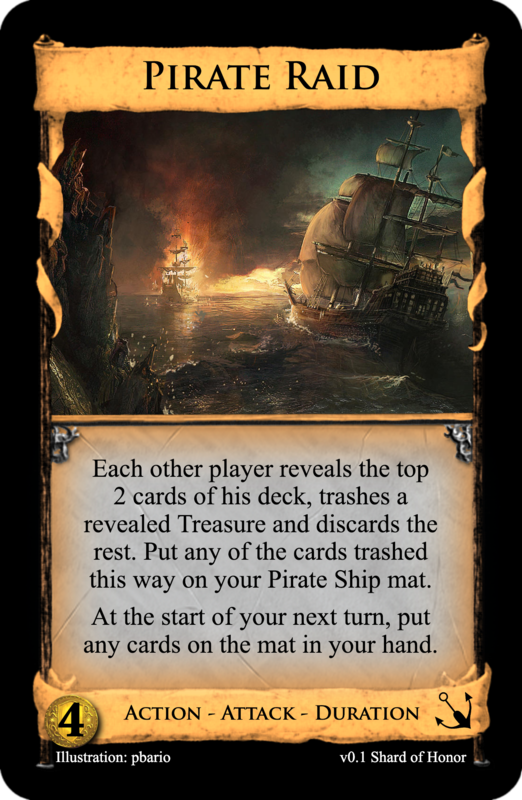 I'm not sure you can really justify removing Salvager either, especially in Seaside with all the duds like Navigator and Pirate Ship and the cards everyone seems to hate like Lookout and Ghost Ship. I'm a bit surprised nobody else went for Alchemy, although actually upon reflection I'm not really. Hilosopher's Stone is of course an awful card that should be replaced. A card that slowly gets better the more you play it is a decent one, although this seems exceeding slow to me. The potion cost slows it down and you need to play 6 Stones before it can match Gold. I don't think taking an Elixir really needs the once per turn restriction either. The big issue is that Alchemy only has 150 cards in it, so if you're using 60 of those card slots for Elixirs then along with Potions eating up space that only leaves enough room for about 5 Kingdom cards or something. Gubump's Farmer, when I read Farmer I thought "how didn't I think of that?" it seems like a very obvious fix while keeping true to the removed card. Runners up: Asper's Thimberlig and Commodore Chuckles' Refinery, I liked these a lot too! Contest #19: Design a Throne Room variant. Edit: If it isn't obvious why your entry could be considered a Throne Room variant, please explain why you consider it one yourself. I'll tell you if it still needs to be changed. +2 Cards. Discard down to 5 cards in hand. You may play an Action from your hand once per card discarded. From a standard 5-card hand, Commission is a Fugitive, but with a 6-card hand, this becomes a Throne Room, 7-cards for a King's Court, and 8-cards for even more. It typically clinches a deck that is able to start drawing itself, but really wants to multiply your payload--somewhat atypical for a Throne Room variant, really. Discarding excess Victory cards to multiply your payload is pretty sweet. While you can Commission Commissions, the first is always wasted on a Fugitive-Commission, so it often feels like a lot of effort compared to targeting your other Actions directly.